Advanced Package Tool (APT) is a powerful and free software package-management user interface in Debian based operating systems, including Ubuntu and LinuxMint to handle the installation and removal of software packages. The apt command has been introduced to merge apt-get and apt-cache into one single command and provide a pleasant experience for end users by efficiently handling packages. APT was first designed as a front-end for dpkg to work with .deb packages, but it has been modified to also work with Redhat Package Manager (RPM) via APT-RPM. 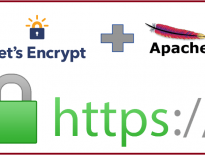 apt-get is the command line management tool supplied with the apt package (to work with APT) which helps to install new software packages, remove existing software packages, upgrading software packages and also upgrading the operating system to the newer version. 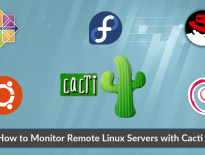 apt-cache is another command line tool which helps you search the available packages for your Debian, Ubuntu, and LinuxMint system. Also, it is used to get the information of software packages. This tool uses the package cache of APT to find packages and package names. With starting from Ubuntu 16.04, Debian 9 and LinuxMint 18, the new apt command is available for you by default. Most of the examples will have apt and equivalent apt-get or apt-cache commands. So, you can use the equivalent commands on older versions of Debian, Ubuntu, and LinuxMint. If the machine has the apt package version 1.0 and above the apt command should work just fine. To install a package, you can use the following command. You can mention multiple package names separated by a space. 0 upgraded, 1 newly installed, 0 to remove and 115 not upgraded. After this operation, 336 kB of additional disk space will be used. This option is useful when you have downloaded the packages (see: example 17) on the system for the local installation. Use the apt command with deb subcommand to install the .deb package. Though the latest package version available for your system, you can install the specific version of a package by appending the version number after the package name and equal sign. You can find the available versions of php for your system, shown like in example 13. To remove any package with apt, run the following command. You can mention multiple package names separated by a space. 0 upgraded, 0 newly installed, 1 to remove and 115 not upgraded. After this operation, 336 kB disk space will be freed. Using an option autoremove with the apt command will remove all unused packages from your system which are no longer needed. 0 upgraded, 0 newly installed, 8 to remove and 115 not upgraded. After this operation, 14.1 MB disk space will be freed. 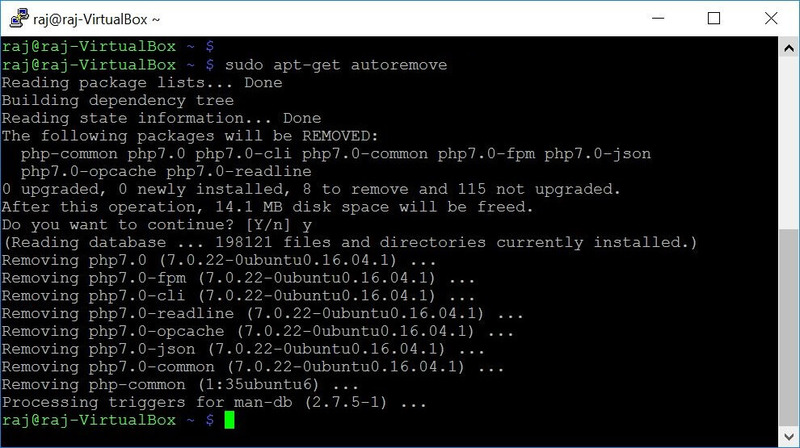 Both apt remove and apt autoremove commands will leave user modified configuration by default when the packages are removed for future installation. However, you can completely remove those leftover files by using the purge command. The update command downloads the package indexes which have up-to-date information about the new and updated packages that are available from locations specified in /etc/apt/sources.list. This command should always be run before an upgrade or a full-upgrade command. You can use the --upgradable to get to know what are the updates available for your system. The command will list packages with the new version available for the system and the current version. To upgrade all the installed packages on your system, you can use the upgrade command. Under no circumstances, currently installed packages are not removed or packages which are not already installed retrieved and installed for meeting dependencies. The dist-upgrade command let us upgrade the whole system similar to upgrade command, but it has smart conflict resolution system that intelligently handles changing dependencies with new versions of packages which means the command may remove or install some packages to meet dependency. Sometimes, you may need to upgrade only one or few packages, and in this situation, you can use --only-upgrade to upgrade specific packages. Note: --only-upgrade is option designed only to upgrade the existing packages; it does not install new packages. 1 upgraded, 0 newly installed, 0 to remove and 263 not upgraded. Need to get 492 kB of archives. Using sub --resinstall command with install command, you can reinstall deb packages to resolve any installation issues. Note: --reinstall will only install the newest version of the software package. 0 upgraded, 0 newly installed, 1 reinstalled, 0 to remove and 263 not upgraded. Need to get 0 B/492 kB of archives. The list command will help you identify whether the software package is already installed or available for your system. The output will have the word “Installed” if the package is already installed. In case it is not already installed, the output will have the name and package version. If you want to get only the list of installed software packages on the system, then use the below command. You can use the below sub --all-versions command to get a list of all available versions of a package. Let us check all versions of PHP package. You can use the search command to search for a particular package. The command will simply list all packages that contain given phrase. the ground up with security in mind. bandwidth limiting, and the Linux sendfile() facility. In some cases, you will need to download .deb packages without installing using the apt command. Below command will download apache2 package to the current working directory. Note: When you use apt download command, the command will download the package along with its dependencies in a single tar.gz file, whereas, the apt-get download command will only download the single .deb package. Performing cleanup activities lets you save the system disk space used by old archived software packages. To clear out the local repository of retrieved software package files, run the below commands. Note: autoclean removes only the packages that can no longer be downloaded, and are useless. However, it keeps the other packages for future installation. With the apt command, you can edit the /etc/apt/sources.list using the text editor. The advantage of using this editor is that it checks for errors after you save and close it. It’s FOSS – Difference between apt and apt-get.